Moscow, 1959. 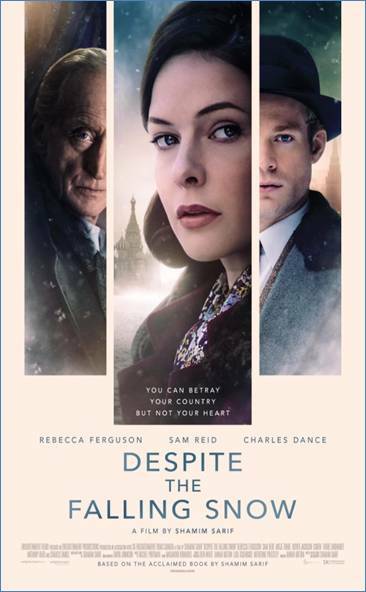 Embroiled in a plot to steal secrets for the Americans at the height of the Cold War, Katya Grinkova (Rebecca Ferguson) finds herself torn between love and duty when she falls for her target, idealistic Soviet politician Alexander Ivanov (Sam Reid). As Alexander prepares for a diplomatic mission to the USA and the net closes around her, Katya must decide whether to sacrifice her love to protect him. New York, 1992. Alexander Ivanov (Charles Dance) is still haunted by the disappearance of his beloved Katya after his forced defection from the U.S.S.R. After 30 years of uncertainty, a surprising discovery may finally help him discover the truth about her sacrifice. The film was edited by Masahiro Hirakubo (The Duchess, Virunga) and the score was by Oscar-winning composer Rachel Portman (Emma, Never Let Me Go). The creative team also includes production designers Bill Crutcher (The Iron Lady, Nanny McPhee, Me & Orson Welles) and Mina Buric (3 Days To Kill), costume designer Momirka Bailovic (3 Days To Kill) and make-up designer Martina Subic-Dodocic.